Bible Promises Quiz – Can You Answer These 7 Power Promises from the Word? A Quiz to Help You Draw Power From the Word! for each one of us to tap into. Why are we not tapping into this great power source that has been provided for us? Good question – huh? Even if you are already drawing on the power of the Word, chances are it is not in the measure it should be. I encourage you today, as I encourage myself, to dig in and fill up! Check out these seven great Bible promises. See how many of the blanks you can fill correctly. Give yourself an extra point for each blank you answer without looking at the choices. 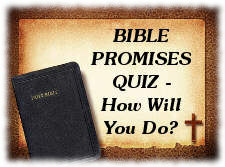 Quiz – Can You Answer These 7 Bible Promises? The solution to tension is trust. Jesus invites us to bring all our problems to Him. In exchange, He offers an end to turmoil and stress. When our task seems to hard, we need to invite the Lord to help. His presence will enable us to work in relaxed efficiency. Going God’s way helps us prosper and ensures that He will give what is best for us. Drop all thoughts of failure, and believe that what you attempt in faith will prosper. God not only hears our sincere prayers, He answers them. We must listen for His answer and look for His guidance. To hope is simply to look forward in faith. Discover how much easier life becomes when you face it with hope. Today, say and think only hopeful things. God is working in all the things that happen to us. Nothing is outside His loving purpose. Believe that, and remind yourself and others daily. Again and again the Bible urges us to think, to focus on positive things. The result? God’s own peace. (Verses 7 and 9) Write down five things that are good and thank God for them every day. The deepest solution to bereavement is God’s tender comfort. From the loss of a loved one to the loss of a job, He can transform any mourning by His understanding presence. Conclusion: Commit these Scripture verses to memory. Draw on the power and practical wisdom they hold. Let these seven Bible promises from the Word of God empower you. May you tap into the great power source of God’s Word and live a life of growing prosperity! Financial Prosperity – Why Not Claim Victory Over Your Finances With a Bold Faith?